Sage Line 50 is one of the most commonly used accounting systems amongst small businesses. One of the benefits of RBA being a Sage Business Partner is that we can ensure a robust link between Sage Line 50 and Retailer using Sage’s integration tools. The resulting solution is used in confidence by many of our customers. This integration module is extremely easy to use and enables both systems (Sage Line 50 and Retailer) to be used side by side. Sage as an accounting system, Retailer to manage everything else from stock control, purchase orders, sales reports and analysis, to invoice production. Can be set to update manually or automatically. There are no additional Sage license fees. Updates Sage with latest cash sales figures, which are posted to the Sage nominal ledger. Sales postings are broken down by payment method, VAT and sales analysis. Posts all new sales ledger invoices to the customers’ accounts in Sage, with the appropriate analysis and VAT breakdown. 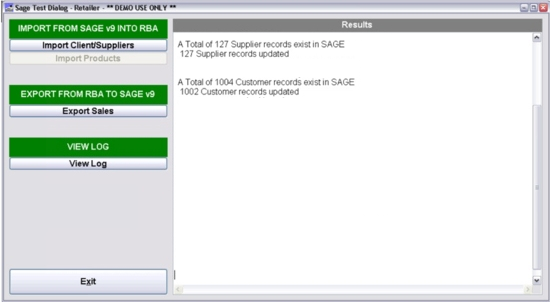 Updates customers’ balances in Retailer V10, from Sage updated records. Multi-Branch capable, by posting to different nominal codes by branch. Updates Retailer with new credit accounts and any changes to existing credit accounts automatically. Updates Retailer with new or changed supplier accounts. One-off transfer of all products in Sage, into Retailer, to aid setup.